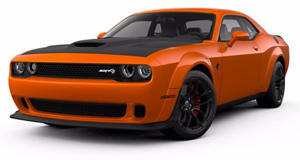 The Demon is built on the same platform as all other Challengers, but it will look unique due to 3.5-inch wider fender flares and the largest functional hood scoop ever on a production car. Dodge calls the scoop the "Air Grabber," and it’s vital to the supercharged 6.2-liter V8’s ability to achieve maximum power. Speaking of which, Dodge has yet to release official output figures, but a previous report believes the Demon will have about 50 more ponies over the "base" Challenger Hellcat. Figure around 757 hp (not 909 hp, sorry). With all of that power, comes great responsibility to cool everything down, so Dodge has outfitted the Demon with its first factory liquid-to-air system, which can drop intake charge by as much as 45 degrees.